Adult Bollywood horror movie poster of the Hindi horror film Qatil Chudail (2001) for sale. 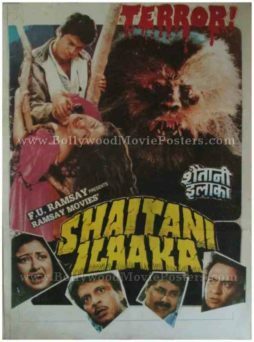 This is an actual surviving adult Hindi horror movie poster of the Bollywood horror film Qatil Chudail directed by Kanti Shah – the undisputed king of B grade and C grade Bollywood movies. 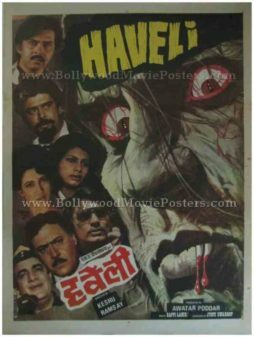 Printed and circulated during the initial release run of the film (somewhere in the early 2000s), this Hindi horror movie poster was printed for publicity of the film but never ended up being used. A ghoul like figure with blood dripping from its fangs is seen in the background of this Qatil Chudail poster. A steamy photographic still of the lead actress wearing a rain soaked white outfit is seen on the left. Various photographic stills taken from steamy scenes in the film are seen below. 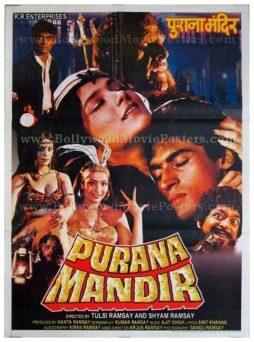 The title of this cult Kanti Shah horror movie poster is seen in bright yellow on the top and bottom. Indian adult horror movie poster of the Bollywood horror film Bhayanak Maut (2000) for sale. 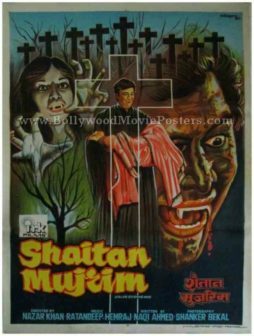 This is an actual surviving Indian adult horror movie poster of the Hindi horror film Bhayanak Maut produced and directed by Bhooshan. 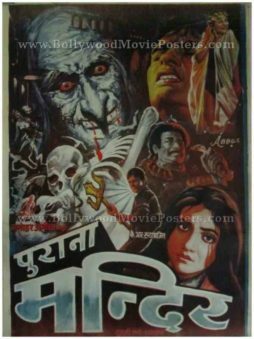 Printed and circulated during the initial release run of the film (somewhere in the year 2000), this Indian adult horror movie poster was printed for publicity of the film but never ended up being used. A photographic still of a ghoul like figure with lightning emanating from its eyes is seen in the background of this Indian adult horror movie poster. A steamy photographic still of the lead actress wearing a rain soaked white outfit is seen on the right. 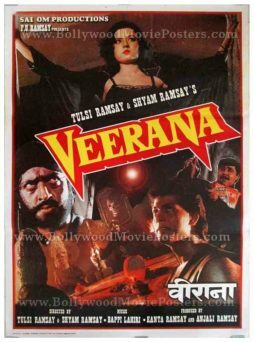 The lead actress is seen prominently in red lingerie on the left of this Indian adult horror movie poster. Typography of the film’s title is seen in a blood dripping styled font in yellow at the bottom of this Indian adult horror movie poster for sale.